Do you have trouble coming up with a menu plan? Stumped about what to cook? That was my situation, lately. 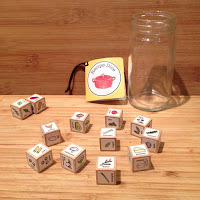 Recipe Dice from Leafcutter Designs came to my rescue! Designed to be playful and whimsical, I found the dice surprisingly practical. I'm keeping them on the kitchen counter now, and frequently roll the dice to see what combinations might fall, which sparks some kitchen creativity. Here's how one dice roll worked for me. First, I put the dice in a larger jar, so they would have room to jiggle and turn while I shook them well. The twelve dice hit the table in a nice scatter. Oh, look! I see pasta and chicken, a great start. Onions, mushrooms, tomatoes, thyme. Yes to all those. Black pepper? Sure, a grind or three of pepper is always a good idea. We're on a roll here (oh, dear, a pun). The rules of this game let me put five dice back into the jar to shake again. Shake, shake, shake. Sprinkle them on the table. Oh! Parmesan and rosemary, I got lucky there. Now I have...eggplant, spinach, and asparagus. So my ingredients are set. I'm allowed to discard two dice, if I wish, leaving 10 ingredients. I can add other ingredients like cooking oil, salt, cream. I could make several dishes - main and sides - or try for an all-in-one. I set the dice for eggplant and spinach to one side, added asparagus to my 'go' pile, and made this wonderful pasta supper. Heat 1 Tablespoon oil in a large skillet. If you are using raw chicken, slice it thinly crosswise, and saute the chicken , stirring often, until it's just cooked through - 3 to minutes. Remove chicken and set aside. Briefly zap the asparagus tips in the microwave, until they are barely tender, and set aside. Return the skillet to the heat. Add a bit more oil, then add the onions to the pan, and cook until they begin to be translucent. Add the mushrooms and cook 5 minutes or so, stirring occasionally, until the mushrooms and onions are thoroughly cooked. Add chopped herbs and cream, bring to a boil, then reduce heat to low. Cook pasta in a large pot of boiling salted water until tender, but still firm to the bite. Drain, reserving a bit of the cooking liquid. Return the pasta to the pot. 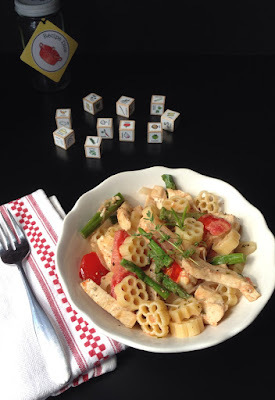 Add the chicken and mushroom in herbed cream sauce to the pasta, along with the Parmesan cheese, the cooked asparagus tips and the chunks of ripe tomato. Toss well to combine, and to melt the cheese. Serve with a few grinds of fresh black pepper.